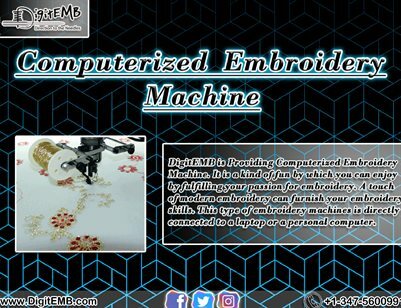 Flyer / 10.75" x 8.25"
DigitEMB is Providing Computerized Embroidery Machine. It is a kind of fun by which you can enjoy by fulfilling your passion for embroidery. A touch of modern embroidery can furnish your embroidery skills. This type of embroidery machines is directly connected to a laptop or a personal computer.